A Chesapeake treasure – steamed crabs! 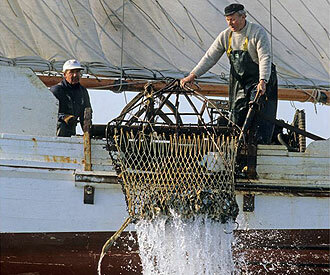 Whether deadrises or skipjacks, pungies or bugeyes, classic Chesapeake workboats are anchored in tradition. Early log-built canoes, sleek schooners, and versatile sailing skiffs all inspired builders to craft variations that matched hull shapes, sailing rigs, and other features to the promise and perils of working the Chesapeake Bay, one of the world’s most productive estuaries. Today, you can explore the region’s unique maritime heritage on the land or on the water, through visits to museums, historic ships, and natural parks—sites that are all part of the National Park Service’s Chesapeake Bay Gateways and Watertrails Network. Start your journey on Maryland’s Eastern Shore at the Chesapeake Bay Maritime Museum in St. Michaels, a charming 18th-century waterfront town. A fleet of historic workboats, some over a century old, are docked at the site, which is also home to numerous exhibits, an active boatyard, and the screw-pile-style 1879 Hooper Strait Lighthouse. Tilghman Island, just a short drive down the road and over a drawbridge, is your next destination. A stop at Dogwood Harbor, home to the last commercial sailing fleet in North America, is a must. Take some time to watch the day’s catch being brought in aboard a traditional skipjack and then learn about the bay’s traditions from the watermen. Be sure to sample the local seafood as well. 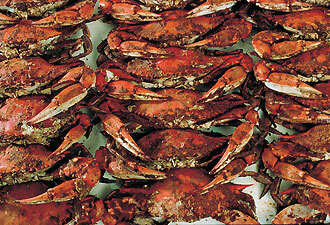 You won’t forget the taste of a freshly caught and steamed Chesapeake Bay blue crab! After Dogwood Harbor, head to the Richardson Maritime Museum, a 45-minute drive south along the Eastern Shore. Situated in the heart of Cambridge’s historic downtown, the site is home to a unique collection of traditional Chesapeake Bay ship models, tools, and artifacts. Nearby, at Ruark Boatworks, you can see traditional boatbuilding in action. Local boatwrights share their knowledge and expertise with volunteers and visitors, so feel free to stop in and watch ongoing projects or lend a hand on Mondays, Wednesdays, or Fridays from 9 a.m. to 2 p.m.
Now that you know the history of the Bay’s boatbuilding traditions, it’s time to get on the water for a sail. Within walking distance of the Richardson Maritime Museum is the Nathan of Dorchester. 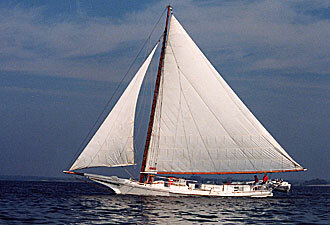 This skipjack was built in the 1990s to exacting specifications of a single-mast working skipjack that once patrolled the Chesapeake dredging for oysters. A volunteer crew takes visitors out for two-hour sails most weekends throughout the summer. The boat functions as a living classroom featuring oyster dredging and related ecological lessons. After your cruise, it’s off to Crisfield, known around the world for its delicious seafood. You can work off some of the calories from your crab cakes at Janes Island State Park, a mecca for paddlers with miles of water trails and pristine shoreline. Then, catch a ferry to Smith Island, Maryland’s only inhabited island on the Bay. Be sure to stop in at the Smith Island Center, a small museum in the tiny community of Ewell. At island residents' busiest time, the crabbing season, the center provides a spot for visitors to learn about the history and culture of this special place, including the famous Smith Island Cake, a multi-layer delicacy designated the official dessert of Maryland in 2008. The Chesapeake Bay Gateways and Watertrails Network is a system of 170 parks, refuges, museums, historic communities, and miles (1,500) of water trails in the bay’s watershed. These Gateway partners provide meaningful Chesapeake experiences, share their Chesapeake connections, and promote citizen stewardship. Come enjoy the Chesapeake and let the Gateway Network be your guide!